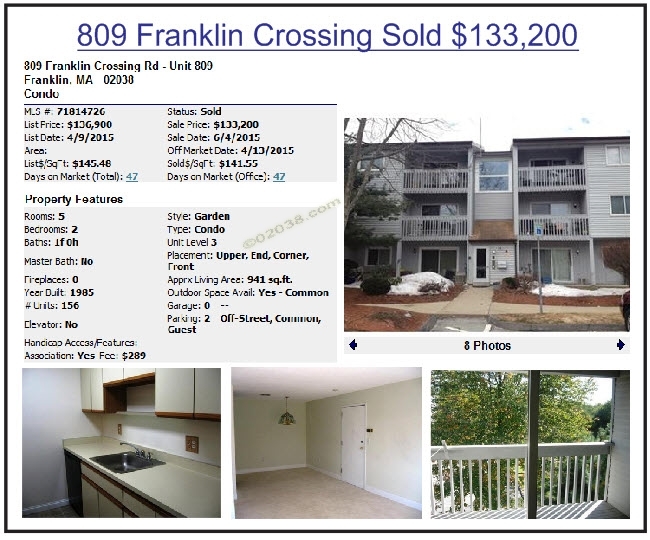 The Franklin Crossing condo community in Franklin, MA experienced some unusual market activity in 2015. The association’s sales statistics for the year in of themselves appear unremarkable, in terms of the number of units that changed hands and the average sales price of the condos sold. 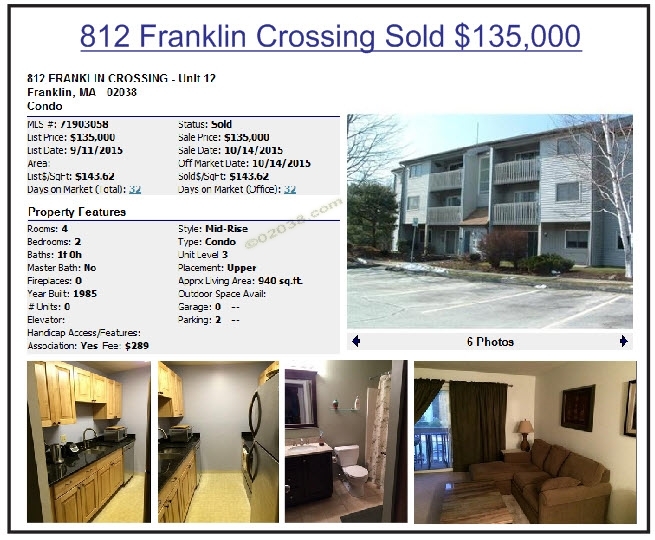 However, as we’ll see below, there was a noticeably large spread between the high and low prices paid for Franklin Crossing condos during the year. 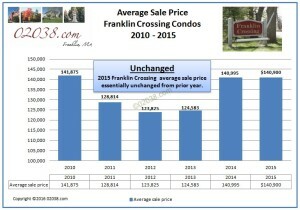 This divergence is hard to rationalize and should create both challenges and opportunities for prospective Franklin Crossing sellers and buyers alike as 2016 unfolds. Unit sales volume for the year fell 25% compared to 2014’s sales totals. 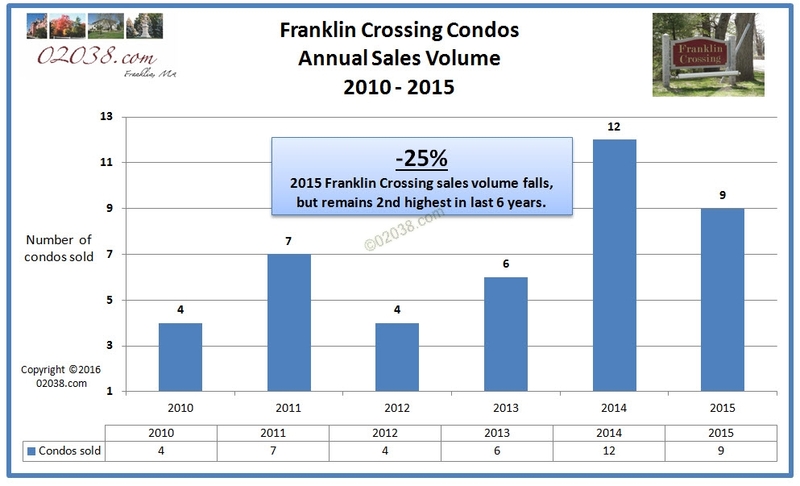 But sales volume at Franklin Crossing had surged in 2014, so a tapering off in 2015 seems perfectly understandable. With 9 condos changing hands in 2015, Franklin Crossing saw the second highest number of unit sales during 2015 in the last six years. So nothing unusual here! 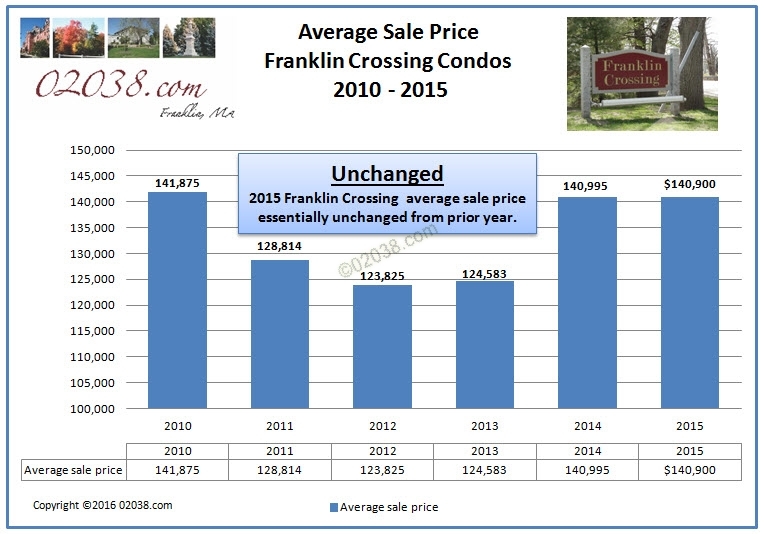 The average sale price of units at Franklin Crossing for 2015 remained essentially unchanged from 2014. 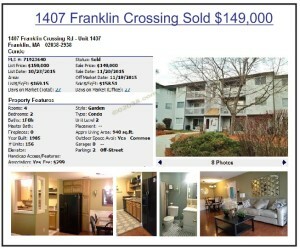 Despite the flat average sale price performance for the year, the tone of sales at Franklin Crossing has improved dramatically since the economic uncertainties of 2009 – 2011. That improvement shows in the 13.8% increase in average sales price at Franklin Crossing since 2012. Again, nothing out of the ordinary in this sale price stat! 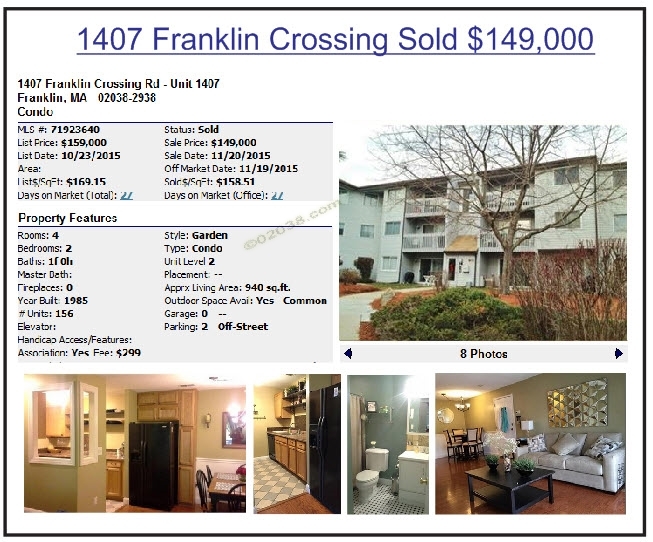 What is interesting (and unusual) with 2015’s market activity at Franklin Crossing is the wide spread between the high and low prices paid for essentially similar condos there during the year. As you can see in the high-low sales above, the degree of updating to kitchens and baths did not play a decisive role in the prices paid for each unit. Less apparent characteristics, including building and unit location, had big influences on the selling prices of these units. 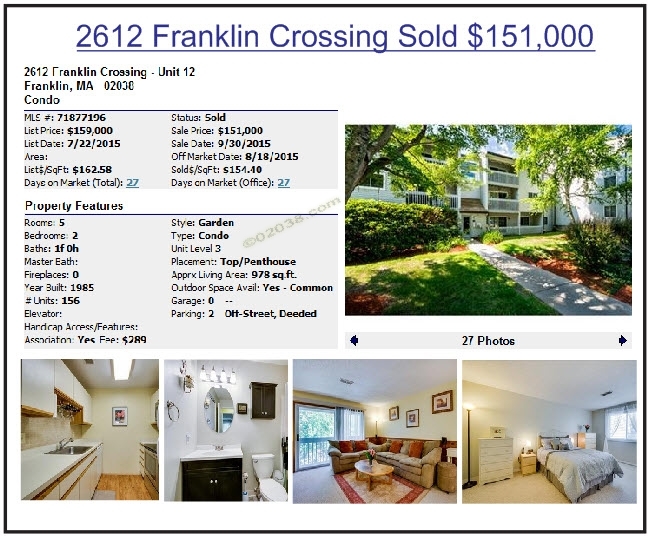 So if you are in the market to either buy or sell a Franklin Crossing condo in 2016, you’d do best to consult with an agent who has physically been inside the recent listings at the community. That “insider knowledge” will go a long way towards helping you make the right purchase and sale price decisions in your transaction! 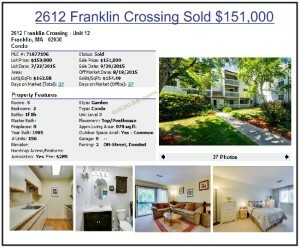 Video drive-through of the Franklin Crossing condominiums in Franklin MA. video shows how close the Franklin Village Shopping Center is to the Franklin Crossing condominiums in Franklin MA. 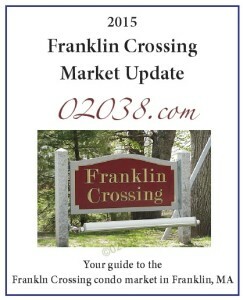 You can learn more about Franklin Crossing in Franklin, Massachusetts here. 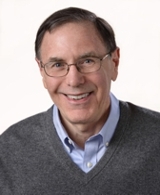 If you’d like to see what your unit is currently worth, contact Warren. To tour any condo units for sale, Warren can arrange access for you!